Daphne Oram (1925-2003) was one of the central figures in the development of British experimental electronic music. Having declined a place at the Royal College of Music to become a music balancer at the BBC, she went on to become the co-founder and first director of the BBC Radiophonic Workshop. Oram left the BBC in 1959 to pursue commercial work in television, advertising, film and theatre, to make her own music for recording and performance, and to continue her personal research into sound technology - a passion she had had since her childhood in rural Wiltshire. Her home, a former oasthouse in Kent, became an unorthodox studio and workshop in which, mostly on a shoestring budget, she developed her pioneering equipment, sounds and ideas. A significant part of her personal research was the invention of a machine that offered a new form of sound synthesis - the Oramics machine. Oram's contribution to electronic music is receiving considerable attention from new generations of composers, sound engineers, musicians, musicologists and music lovers around the world. Following her death, the Daphne Oram Trust was established to preserve and promote her work, life and legacy, and an archive created in the Special Collections Library at Goldsmiths, University of London. 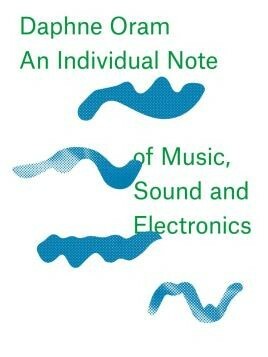 One of the Trust's ambitions has been to publish a new edition of Oram's one and only book, An Individual Note of Music, Sound and Electronics, which was originally published in 1972. With support from the Daphne Oram Archive, the Trust has now been able to realize this ambition. An Individual Note is both curious and remarkable. When commissioned to write a book, she was keen to avoid it becoming a manual or how-to guide, preferring instead to use the opportunity to muse on the subjects of music, sound and electronics, and the relationships between them. At a time when the world was just starting to engage with electronic music and the technology was still primarily in the hands of music studios, universities, and corporations, her approach was both innovative and inspiring, encouraging anyone with an interest in music to think about the nature, capabilities and possibilities that the new sounds could bring. And her thinking was not limited to just the future of the orchestra, synthesizer, computer and home studio, but ventured, with great spirit and wit, into other realms of science, technology, culture and thought. An Individual Note is a playful yet compelling manifesto for the dawn of electronic music and for our individual capacity to use, experience and enjoy it. This new edition of An Individual Note features a specially commissioned introduction from the British composer, performer, roboticist and sound historian Sarah Angliss.